A decade has passed since Illanna became head of the Night Guild and their war with the Bloody Hand, a rival gang from the city of Voramis, approaches its end. She wants to stop them smuggling drugs and prostitutes into her city once and for all. When she gets a lead on the agent behind their current plots, she decides to travel to Voramis with her most trusted agents. She’s walking right into the Bloody Hand’s territory. If she’s not careful, she could bring down the entire Night’s Guild. 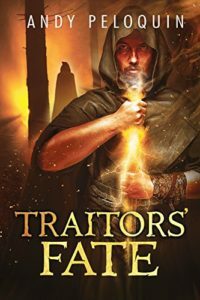 The Traitor’s Fate is a bridge between Andy Peloquin’s two book series an epilogue to one and a prologue to the other. If you’ve read any of his Hunter of Voramis series, then you will recognize where this story ends, leading right to the start of that story (soon to be republished under a new title). It also adds as a nice resolution to Illanna’s story, showing how she, her lover, and her son are doing a decade into her rule of the Night Guild. This story was a delight to read, stepping one last time into Peloquin’s world, adventuring with Illanna once more before handing off the story baton to his other protagonist and the bittersweet knowledge of where that story is heading. 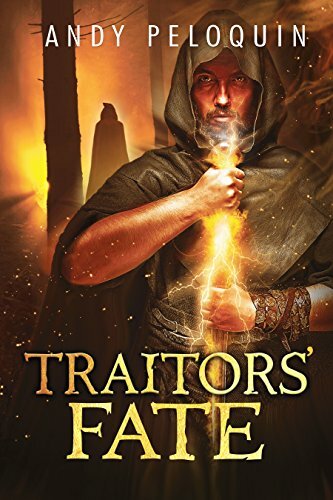 Fans of Peloquin will love this series, and if you enjoy Grimdark Fantasy then you need to take a look at his catalog. The Night Guild Trilogy and his upcoming series about the Hunter of Voramis are indie treats worth reading! You can buy Queen of the Night Guild form Amazon!